We have already covered many exciting things that are coming to TMS WEB Core v1.2 Padua such as support for 3D graphics or cross platform desktop applications with Electron, but there is still more to come! We would like to introduce another addition to you, that we have created from the widely known and used open source Ace editor. We have also exposed and created editing calls (undo, redo, text replacement and removal, and more) that are accessible programmatically. 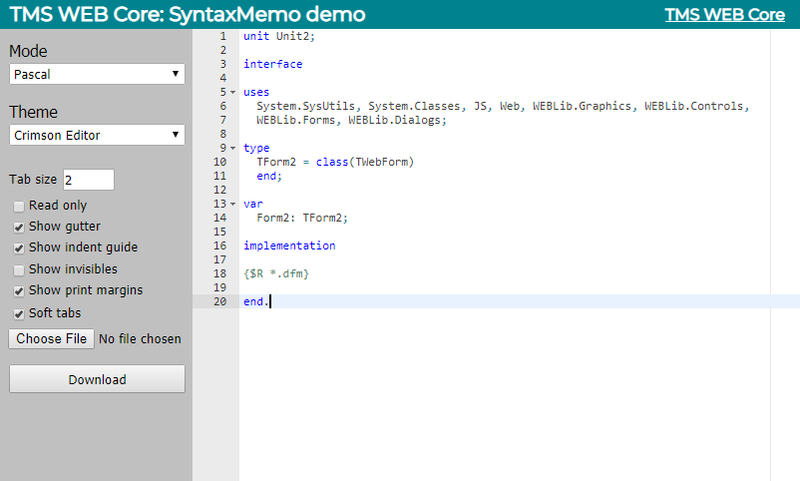 To provide an easy use to the developers the TWebSyntaxMemo also has properties that you are already familiar and comfortable with (Text, Lines, SelStart...)! 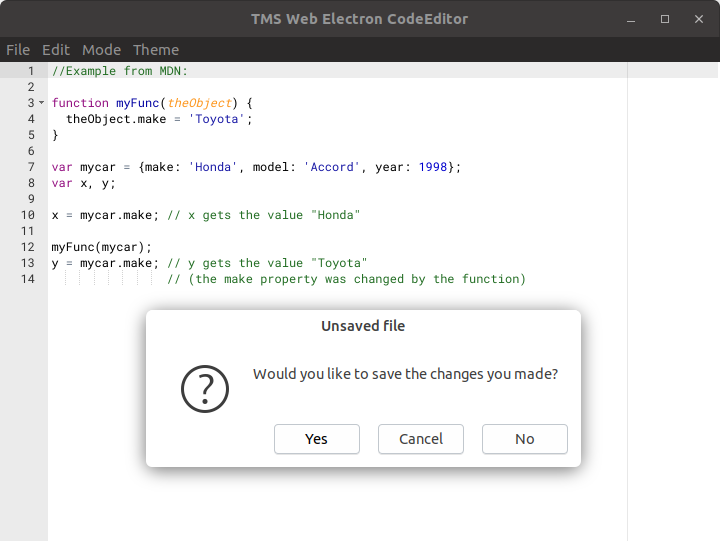 Combining everything that has been mentioned above and what's already available in TMS WEB Core, instead of days of work, you can have your own code editor in a matter of an hour! 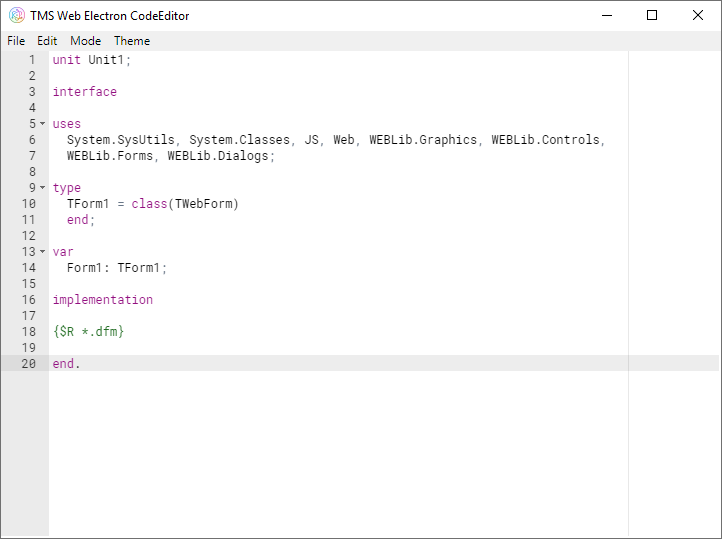 With very little effort you can create a web application that is capable of loading a file, detecting the opened file's extension and changing the editor's mode on the fly to match the file's type. You can add support for drag and drop functionality through the exposed events too! 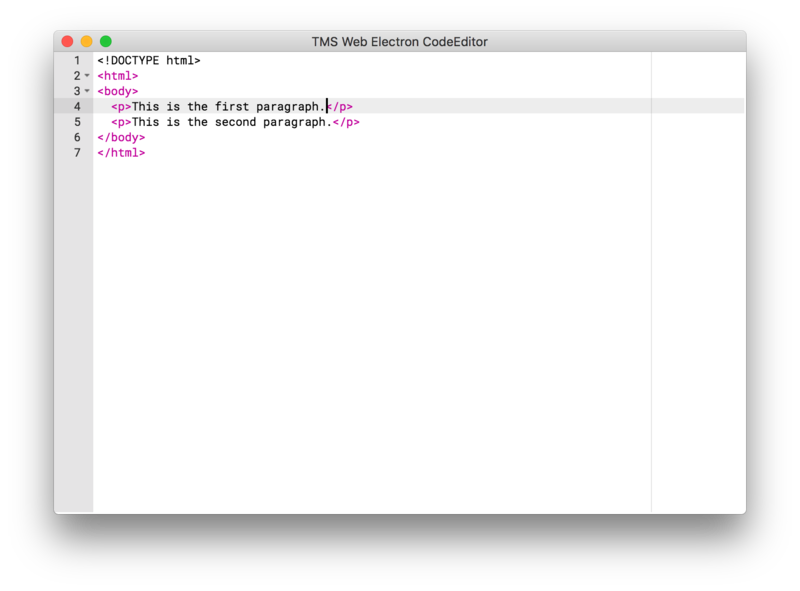 TWebSyntaxMemo is going to be available for regular web applications, PWA and Electron applications at the same time! A demo for Electron will be waiting for you in our next release, but if you can't wait to check out the TWebSyntaxMemo in action, then you can already take a look at our demo here. 1 - No reponsive components out the box. I really would love to see that these two issues were resolved or that there was an evolution in these aspects because the web world is at present is a responsive world, and we programers cannot only focus on desktop screens. But as I said , wonderfull work so far has being made by the TMS team. 1. There is now the responsive grid component and in the next release there will be a responsive panel. Of course, responsive behavior can be built-in in the HTML template.